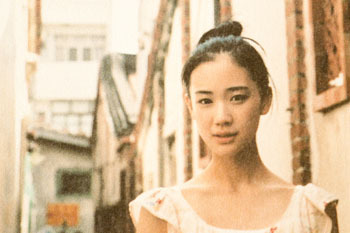 Kaiten TE-BURU wa Mutsukashii (something to do with rotating tables in restaurants…) is a 2007 photobook by Japanese actress/model Yu Aoi, with photographs by Ivy Chen, who worked as on-set photographer on Aoi’s films All About Lily Chou Chou as well as Hana & Alice – both directed by Shunji Iwai. 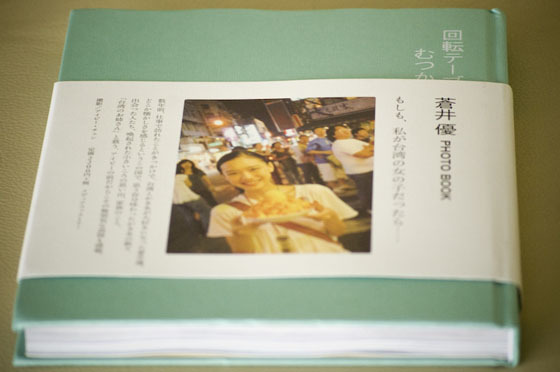 The book details Aoi’s and Chen’s visit to Taipei (Taiwan) as they go on a full-on Foodie trip. During the course of the trip, they visit over ten bakeries/cafés/shaved ice places that seem to be so popular over there, and take photos of what they eat and who they run into. Besides being a fan of the featured star (there are a lot of cute shots), you will also need to be a fan of food because there are a lot of shots of shaved ice with fruits, condensed milk, and even some weird food with sweet corn and taro. With over 100 photos included in the book, however, I only find eight shots that I truly enjoy, and all of them resemble subjects that could be inserted into some fancy fashion magazine shoot, not the book. 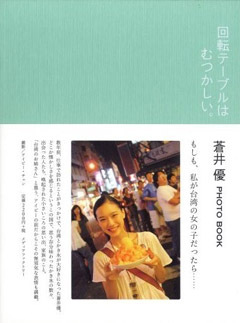 Moreover, this lacks the plastic cover that previous Yu Aoi photobook releases (Travel Sand, Dandelion) have, which protects the book from anything that might stain it.